Jennifer Chang is the author of The History of Anonymity and Some Say the Lark, which was longlisted for the PEN Open Book Award and won the 2018 William Carlos Williams Award. Her poems have appeared in American Poetry Review, The New Yorker, Poetry, and A Public Space, and she has work forthcoming in The Literary Review, New England Review, and The New York Times. She co-chairs the advisory board of Kundiman and teaches English and creative writing at George Washington University in Washington, D. C.
Lisa Olstein: “Form sets the thought free,” says Anne Carson, and I believe her. How did form and thought co-evolve in the unfolding of this work? 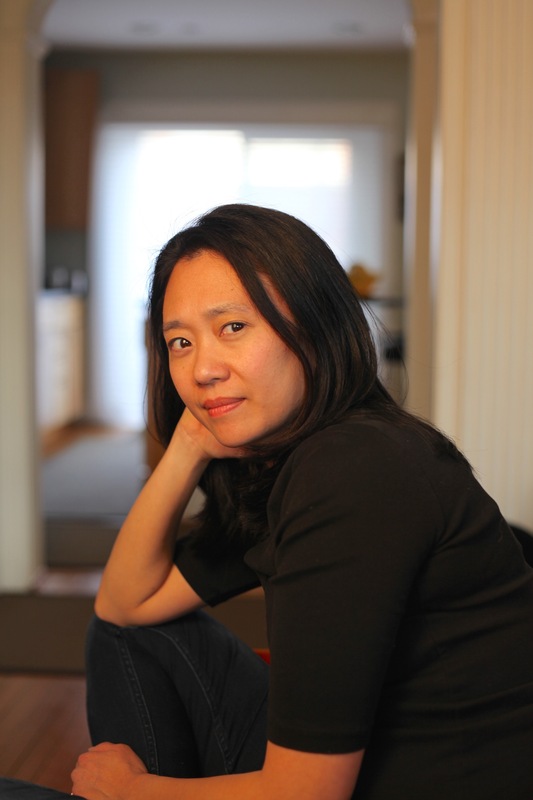 Jennifer Chang: It took ten years to write Some Say the Lark. The first title I’d had was Stranger. Briefly, the title was Future Snow. (One friend liked it, one friend hated it.) Once I arrived at Some Say the Lark, I realized that the book was deeply informed by and invested in dialogue, discursive practices. Many poems are born from conversations between intimates and strangers, across history, en plein air and in the mind. “Some say the lark makes sweet division / This doth not so, for she divideth us,” Juliet tells Romeo, rejecting the conventional thinking about birds (and poetic discourse) and demanding a new clock and narrative situation for their love. Hers is a fleeting critique within a fleeting scene, but it’s radical. The template of Juliet’s rhetorical performance—and the concept of conversation, more broadly—was the first form that freed me to write the book, as it had to be written. I was thinking etymologically, too. “Conversation” from the Latin “con” for “with” and “vertere” for “to turn” – the same root as verse – evoked a sociality, to turn with or together, that I’d been asking of lyric poetry, which historically derives from a privacy. (Mill’s definition: “an utterance overheard.”) Who were my intimates? Friends and random interlocutors I met along the way, Patsy Cline, poets of the past like Coleridge and Wyatt, that bugbear of my heart Robert Frost, my mother, old loves, neighbors, a drowning victim named Robert Nguyen, a childhood friend, historical women in the shadow of “genius” like Susan Fenimore Cooper and Edith Lewis, a horse stabled in Rock Creek Park, people I made up. My intimates were largely strangers. I wanted the poems to have the unpredictability, occasional insights, and lulls of a good conversation, in which you find that in “turning with” someone you begin to think together. In terms of form, I wanted to make a barely controlled mess, to wander freely without losing the reader. I turned to quatrains and bulky, page-long stanzas, and I frequently denied myself neat resolutions. One example is “Mount Pleasant.” There was something too polished, too clean, in the earliest versions, so I went back and intentionally gave the poem a couple of much-needed detours. It was a poem observing my neighborhood, but in the course of writing the poem, I began to question the distance from which I was engaging with my world and the people in it. I was a new mother; my son was newly verbal. He loved to say hello to neighbors, whereas I was stubbornly holding onto my shyness, a lame excuse for being anti-social. I was also thinking of Coleridge’s “conversation poem,” “Frost at Midnight,” which springs forth from a similar parental insomnia. Formally, “Mount Pleasant” changes its mind somewhere in the middle, or rather, the speaker has a kind of awakening about citizenship, to put it prosaically. But really I had changed my mind about “Frost at Midnight” and my own habit to disengage. I couldn’t be in a pastoral elsewhere of place and mind, which is what the speaker in Coleridge’s poem desires for his child: I had to learn how to be here in the uncomfortable crowd of our city. For my kid’s sake, I had to stop hating everyone and be a better neighbor. Similarly, in “Lost Child,” I sought to push the poem to its farthest limits. That poem began as an attempt to write a Sapphic stanza, a form I had failed miserably at in poet-translator Anne Winters’s workshop in college. Again, I failed. However, while drafting, every stanza was an attempt to figure the form out, and this reflected the speaker’s compulsive cathexis: she doesn’t want to stop thinking, remembering, making language because she’s so engrossed in her wound, a melancholic shame about abandoning a childhood friend. I shared an early draft with a friend, who noted that the last five or six stanzas could be cut. The friend was right, and yet, I realized there was something significant about the poem’s final hesitations. If the poem stops, then the conversation with the past stops. To me, that wasn’t devastating enough, especially as a portrait of an unresolved friendship. I wanted to see if the poem could bear the pressure of such excessive discourse, to speak beyond necessity. LO: What felt riskiest to you about this work? JC: Early in my career as a poet, when I was first submitting poems to journals and fellowship competitions, I would repeatedly encounter the critique that my work seemed unrelated to my biography. I understood that these editors and judges were reading my work as insufficiently Asian American, that my work did not meet their expectations for writing by a person of color. This was as annoying as it was constricting. I thought my writing was Asian American, despite the lack of whatever they think makes for authentic Asian American writing. Ethnography? Bilingualism? And yet, at the same time, I wondered if I was hiding behind metaphor and mythology because I didn’t know or want to write about race or identity. I was confused. Wasn’t writing about the self an interrogation of identity? Or, worse, had I internalized the misguided aesthetic imperative that literature be apolitical and universal (and therefore non-threatening to white readers)? In writing Some Say the Lark, I was intentional about writing about race and my Asian American identity on my own terms. I wanted to make the reader uncomfortable. I wanted the reader to know I was pissed off at the world and quite possibly at her. My poem “Mount Pleasant” was the poem in which this strategy became clear to me, as it reveals the speaker’s difference late in the poem. I write: “as anyone can see, there’s an immigrant on my face / who makes me stray / who makes tired of you and you and you, all of you / the never outside my window.” When I recite these words at readings, I actually see people squirm in their seats, as the speaker has turned ornery, indicting the reader for not seeing the speaker, from the first, as an Other. That’s one way to read it, but I delay this reveal because I do wonder when identity figures in a reader’s imagination and whether we recognize how often we all enter the space of literature believing it to be a white space. This is a risk because who wants to read a poem that’s antagonizing them? Elsewhere, I do it more quietly, subtly, but most people of color are acutely and immediately aware of the sociocultural dynamics of the rooms they enter. We are raced, Other-ed, and marginalized before we are seen, if we are seen at all, and this is a physical, psychological, and physiological experience. I open the book with “A Horse Named Never,” a poem loosely based on Thomas Jefferson’s Notes on a State of Virginia, because I wanted to foreground how these dynamics are historical and reinforce unexamined power structures. That’s a disorienting way to begin, but disorientation is one route to new knowledge. Anyway, who’s disorientation are we experiencing? Who’s misreading, and who’s misread? Throughout the book, I wanted identities to emerge like passing thoughts or scenery, particularly in the poems about female friendship. To read marginalized identities as in the background enunciates how we pay attention and to what. You only think one thing is in the background if you’ve decided another thing is in the foreground. When I teach visual aesthetics, I ask my students to recognize that what they see first and last suggests their subjectivity and not the artist’s. Which is to say, my poems have always been Asian American, even the ones about forests and ex-boyfriends, and Some Say the Lark is an Asian American book. That anyone ever thought otherwise means not only that their conception of Asian American poetry is too narrow but also that they weren’t reading carefully enough. LO: As a medium somewhere between time-based and static, poetry engages temporality in a fascinating range of ways. How does time operate inside this work and across the experience it creates? JC: Poems are like time machines. They travel through time as a medium for individual memory and, as a genre, they engage historical time, collective cultural memory. But I think poems also activate a simultaneity of past, present, and future. A poem’s rhythm moves us forward in time; the imagination a poem (hopefully) sparks posits futurities, a constellation of potentialities. Considering the nexus of verb tenses versus the present tense of the reading experience, a poem has already happened, is always happening right now, and will soon happen again. I think the book is always asking this question. What time is it? The work of answering that question begins to place where I am in history, where I am in space, and whether the smallness of my life (all that marginalizes me) can be a measure of more than ordinary time. Which is to say, can ordinary time – and now I’m thinking of that term as sociocultural – transform into historical time? It feels impossible, to be honest. I had a friend who used to ask me to distinguish between major and minor poets, often nitpicking that Gertrude Stein was a major minor but Ezra Pound was a minor major. What does that even mean? How truly terrible to evaluate in this way, and that conversation drove me nuts, but it speaks to a common anxiety artists experience that I think was tucked into my own preoccupations with time. “I live in history,” I write in another poem, and I meant that as both the specific personal history of my small life and the daunting history of writing poems in English in the 21st century. LO: What kept you company during the writing of this work? Did any books, songs, art works, philosophical treatises, snacks, walks, or oddball devotions contribute to a book-specific creative realm? JC: Perhaps there’s a hidden map in this book of all the walks I took to clear my head for thinking and thus writing. Walking figures literally in a few poems (“River Pilgrims,” “Small Philosophies,” “Habit,” “We Found the Body of a Young Deer Once,” “Signs”), and in an earlier version of the manuscript, “the walker” was a recurring character across poems, though he exists only in “Habit” now. The imaginary of this book—of my life!—is walking outside even when a speaker or scene is inside (in a room or in memory). There are many reasons for this. First, in the course of writing this book, a dog came into my life, so suddenly I was taking longer walks every day, which inevitably expanded my sense of place. Suddenly I was spending a lot of time in forests and off-trail, in uncultivated spaces like meadows and wetlands. This experience brought me back to my childhood, years of which were spent in the woods behind my house. So these walks with this young dog—who is now an old dog—allowed me to wander in and through time, in and through space, and I know this altered my engagement with my work, the page, and the interplay between silence and sound. How noisy the mind is, how noisy the field in repose, and, nevertheless, how overpowering silence can be once you find it. Second, this book had many stops and starts that took often took place in winter, when I am freed from the academic calendar. I spent two winters in a row at Yaddo, in upstate New York. I vividly recall trying to take a walk after an ice storm, the forest floor glazed over, dangerously sleek. The difficulty of walking that day was almost meditative in that I had no thoughts, no mind, no self, no sense of time. It was exhausting, but I felt free. It is impossible for me not to think of walking without thinking of thinking. There is the example of Kant, and there is Baudelaire’s flâneur, Thoreau’s ruminations, and de Certeau’s practices. Consequently, while walking put me in company with myself and my physical environment, intensely, it also put me in company with a history of inquiry that is epistemological, ecocritical, cultural, phenomenological, and inescapably white and gendered. How safe was I, as a solitary woman walking in a forest or a strange city? In walking, I was forming a cartography of my hours, of not writing, of my particular silence and others. I was acutely aware that historically such cartographies have long documented freedoms that exclude women and people of color. As you can see, I got very lost writing Some Say the Lark. What I learned from these companions was how to make getting lost not an impediment to writing but essential to what and how the book means. LO: How has it been to shift out of the creative space of this book? What are you working on now? JC: I have essayistic, epistolary poems in mind, poems about my family throughout the nineteenth and twentieth centuries, but I haven’t yet figured out how to write these poems. Instead, I’ve been lately fascinated by the trees of Washington, D.C., the bureaucracy of nature in my city. There is an Office of Urban Nature that dispatches arborists into the neighborhoods to take, for lack of a better word, demographic survey of the trees. When a tree is deemed obstructive or unhealthy, whoever’s property that tree stands on is charged with its removal. Twice, my neighbor has had to take down (at significant cost) trees that were over a century old; each time the light changed, literally. Once I spent all day watching a crew of tree workers dismantle a massive oak chunk by chunk, down to the roots. I was on maternity leave. It was a slow process. The tree had always struck me as majestic. It provided shade for the back lots of three houses, and then it was gone. I’m writing about this, but I don’t know if anything will come of it. After each book, I am just drifting from one curiosity to another. It’s my quiet interlude. I think, and I occasionally take notes that might launch a draft of some sort. (See above trees.) I throw out a lot. I read as much as I can. When I’m not in a book, writing or reading one, I’m just in the world talking to people, doing my job, walking around, looking at things. It’s just living, which is pretty creative too. Lisa Olstein is the author of four poetry collections, most recently, Little Stranger (Copper Canyon Press, 2013) and Late Empire (forthcoming in 2017). Her chapbook, The Resemblance of the Enzymes of Grasses to those of Whales Is a Family Resemblance, was a winner of the 2015 Essay Press Prize and will be released in fall 2016. Recipient of a Pushcart Prize, a Lannan Writing Residency, and fellowships from the Sustainable Arts Foundation, Massachusetts Cultural Council, and Centrum, she is a member of the poetry faculty for the University of Texas at Austin’s New Writers Project and Michener Center for Writers.